When American Express came up with Small Business Saturday three years ago I was beyond elated. 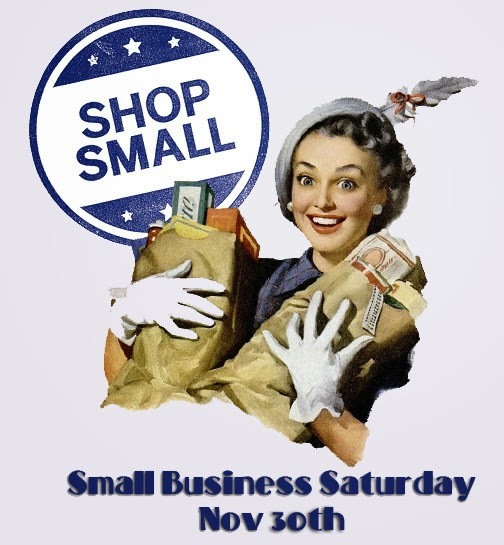 I am huge believer in voting with your dollar by shopping at small, independent businesses and what better time of the year to promote this idea than when everyone is rushing out to the big box stores for the biggest shopping weekend of the year? Sure, I like a good deal on just about anything and occasionally do enjoy venturing out into the chaos known as Black Friday, but the benefits that come with shopping small far exceeds the bargain basement prices of Black Friday. When you shop small 52% of what you spend goes back into that very same community. Can that be said of Walmart, Macys, or Sears? I highly doubt that. While some critics say that this campaign has done more for American Express than the small businesses themselves, I still think the exposure this idea gets reaches far beyond the money that American Express makes off of its cardholders on SBS. I love that this caught on and I hope that it inspires people to shop small and not just that one day a year they are asked to. Small businesses are not just found on Main Street. Majority of etsy sellers are independent business owners, supporting themselves through the platform of etsy. When someone buys a vintage dress from me that money not only goes to my living expenses, but also to local Detroit farmers at Eastern Market, to local charities run by the Salvation Army, to my independent health food store, and many of the other small, independent businesses I shop at on a daily basis. So I urge you to get out to Main Street or Etsy this Saturday and support these businesses! In case you can not decide about purchasing the suitable type of replica watches then you can ask someone who has been wearing it. They are able to offer you about its efficiency and reliability. One thing else of note is replica watches sale also have two or three years guarantee. One particular will need to constantly speak in regards to the guarantee is valid which contains a certificate is stamped by a replica watches sale. The buyer is not going to become disappointed with any of these rolex replica sale about style and functionality. It really is my opinion the consumer may possibly come across any in the replica watches uk to become a technologically advanced, yet inexpensive wrist watch to put on for every day use. Also, it really is suitable for each and rolex replica sale from children on the elderly, lots of people are becoming a great deal even more attracted to bling. Early Bird Special! Coupon Code!